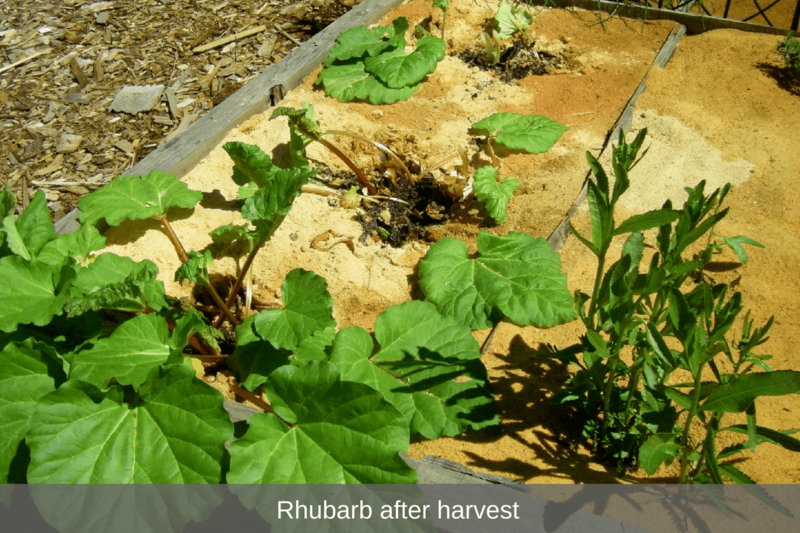 Going out to the garden, I noticed that my rhubarb was getting out of control so I decided to make up some rhubarb crisp. 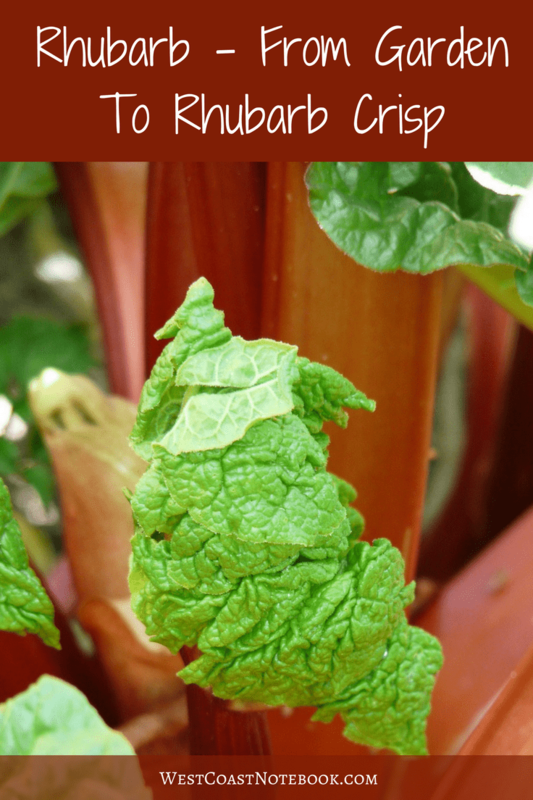 It’s always nice to see things growing in the garden and the rhubarb is definitely one of the first things that come up in the spring. The leaves were bright green and large and the stalks were a ruby red all plump and crisp. Made my mouth water at the sight of them. It is so easy to pick. All you do is to grab a stock and pull. It will come away from the main plant easily. If you haven’t read it yet, here is an article I wrote about putting sawdust as a mulch and it seemed to work really well. 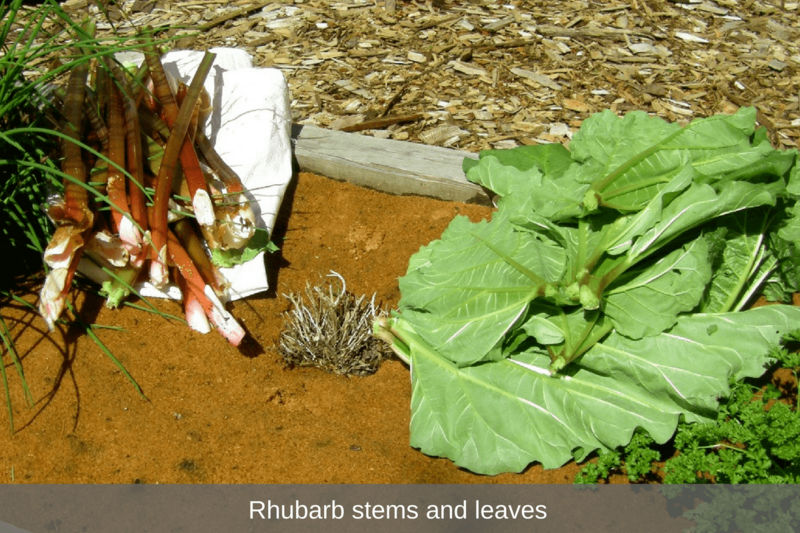 The rhubarb has flourished and all there is on the end of the stems is a little sawdust to clean off. Not even any dirt. The first thing I did after pulling up the stems was to break off the leaves and throw them immediately into the compost. First, it saves bringing all that extra foliage up to the house, but also, it gets rid of the leaves right away as they are toxic. If indeed someone ate the leaves click here to see the procedure to follow. 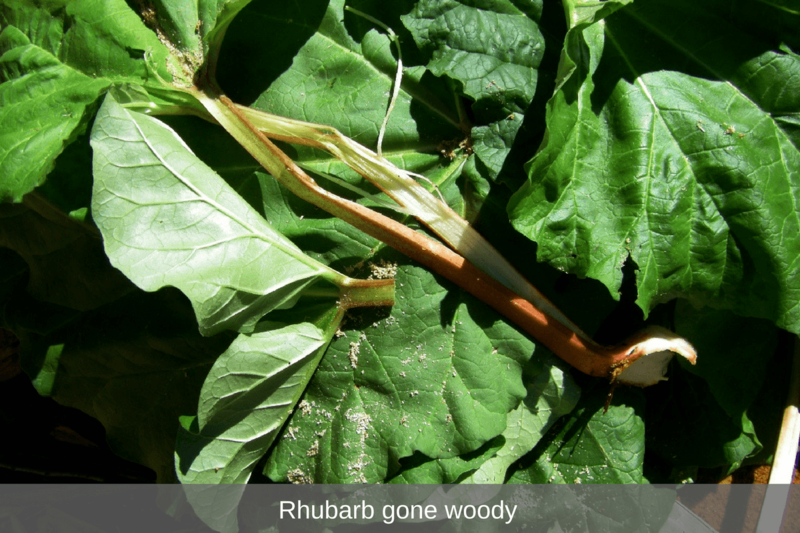 Sometimes when you are picking the rhubarb you will feel like one might not be as plump as the other stems. I find that if I can press it together with my fingers, that I usually discard it. As you can see from the picture below the stem has gone woody inside and there is no juice. I got a nice harvest out of the rhubarb and I just left a few of the smaller stalks to grow larger. And now for the good part. I took the above harvest and washed it with a hose. I try and do most of the washing outside to keep the dirt where it should be and not in the sink. The sawdust was easy to wash off and didn’t require any scrubbing. So far, I’m really pleased with growing in sawdust. Then, bringing it into the house I cut the tops off where I had broken them and cut off the bottom where the stem goes white where it was attached to the main plant and put them in the compost bucket. 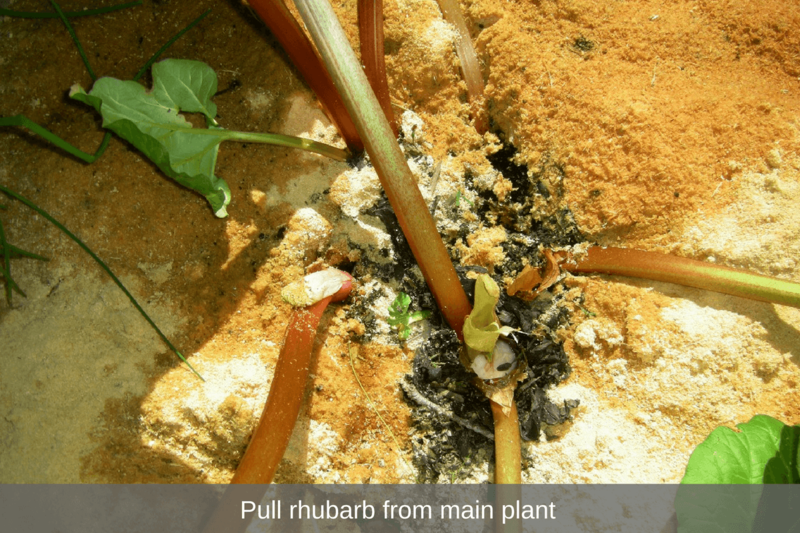 First things first… you take the rhubarb plant and put the cut end into a bowl of sugar and munch. Brings back childhood memories of when mom allowed us to do it and it’s tart and sweet at the same time. I have to admit though that I remember it being better as a child, so one bite was enough. 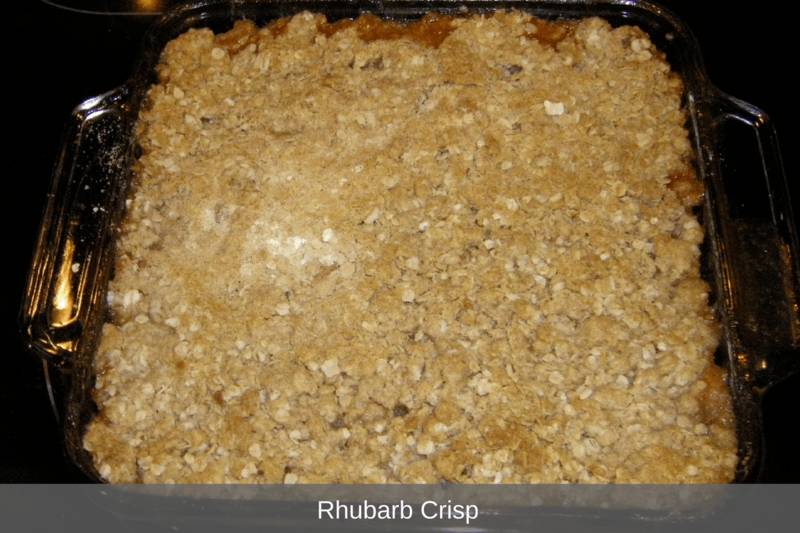 Here is an easy recipe for rhubarb crisp and one that I use for all my fruit crisps just changing the fruit and the amount of sugar depending on the sweetness of the fruit. 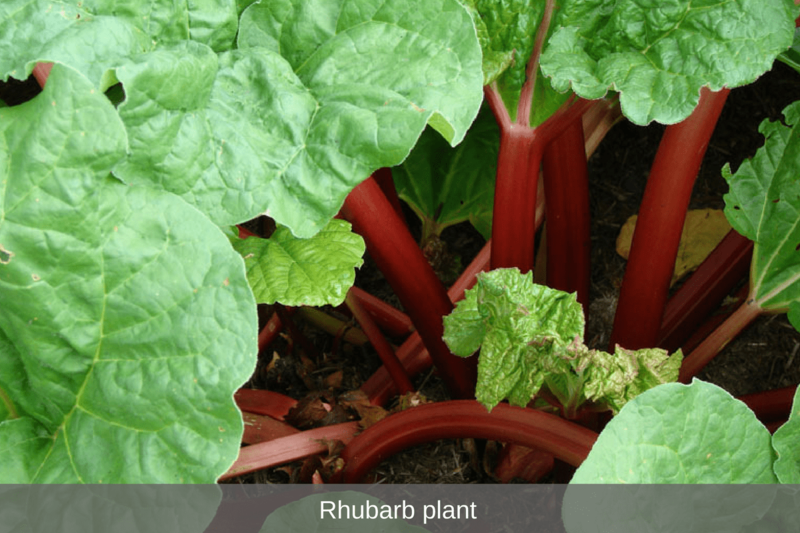 Take rhubarb and cut it into 1/4 inch pieces, approximately 3-6 cups or whatever fits into the pan. This is not an exact science. Combine all dry ingredients in a bowl and cut in butter until mixture is crumbly. If you don’t know how to cut in butter there is a quick video to watch here. 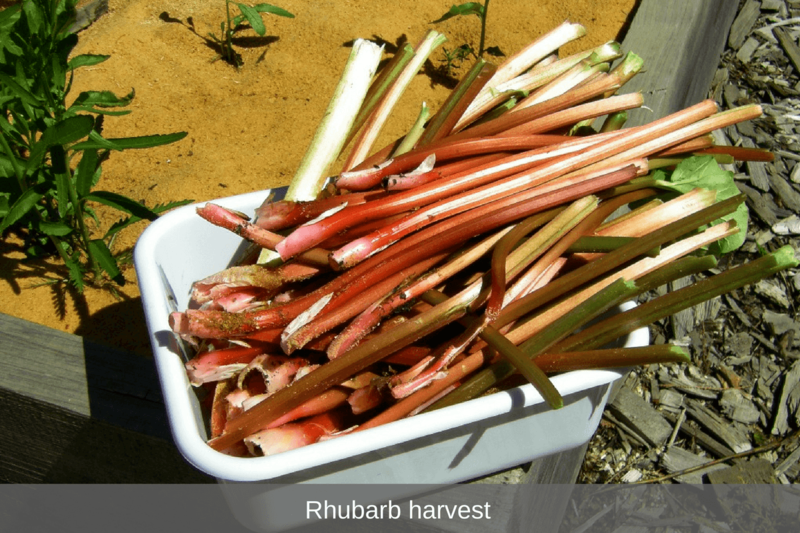 Spread the mixture over the rhubarb and press it down onto the fruit. Bake at 375 degrees F for 30 minutes and serve warm or cold with ice cream or whipping cream. Warm is definitely the best, just right out of the oven. 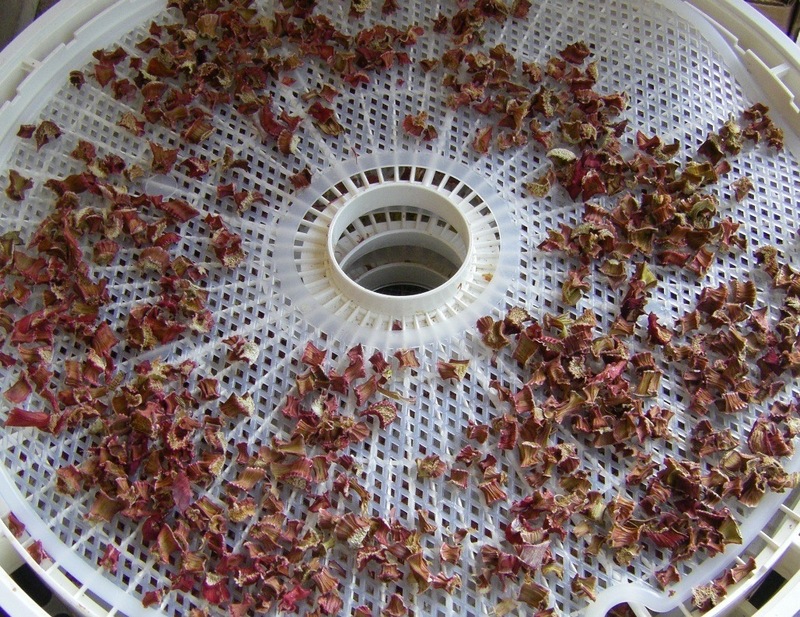 The rhubarb that I had left over I dehydrated by cutting into 1/4 inch pieces and putting in the dehydrator overnight at 125 degrees F.
When they come out they are just tiny pieces as they have a lot of water content and I put them into a sealed jar. They are great when you are having pork or another dish that requires a tart taste. All you need to do is to rehydrate and use them to make a jam, sauce or compote.